In the last week we had our first measurable snow in Massachusetts. 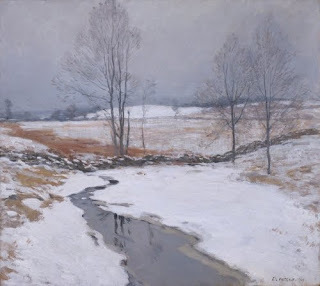 I’m totally the kind of dork who’s all “it’s so pretty to walk around when it’s snowing.” And since there are not many things in life that don’t remind me of art, I thought of winter landscapes. I think snow scenes in art are one of the most enjoyable types of comfort food for the eyes. There’s just such a variety! You knew I would show a Ukiyo-e print with a snow scene, because I’ve said before what an admirer I am of those woodblock artists. I used an umbrella last week when it snowed, though not with such flare as these folks. The samurai on the left has the most gorgeous patterned outfit of all of those featured in this print. It goes to show how influential the prints were on fashions of the period. Kunisada was the son of a relatively well-known poet in Edo, whose artistic talent manifested itself early. His ability was noticed as a youth copying actor prints. In 1800 he became an apprentice under Utagawa Toyokuni (1769–1825), whose name Kunisada subsequently adopted (1842) to honor the master. Kunisada became a great master—one of the last greats of the late Edo period—in his own right, adapting, like his master, all of the range of popular ukiyo-e subjects. Like Toyokuni, Kunisada favored actor prints, a specialty of the Utagawa school. Although Kunisada started out producing primarily actor prints, he eventually branched out into bijin-ga (pictures of beautiful women) and, in the 1830s, he dabbled briefly in landscapes. The American artists who absorbed the Impressionist style really did an awesome job of it! It’s almost scary. This winter landscape just begs the viewer to walk through that misty landscape. The ability to invite a viewer to take a stroll through a painted landscape was one of the tests of traditional Chinese and Japanese landscapes. Metcalf has succeeded. Metcalf, born in Lowell, MA, first studied in Boston. Like many of his colleagues, he studied in Paris in the 1880s (1883–1886 to be precise). He gradually learned to prefer the short, clean brush work of Monet and his colleagues, and also dabbled in the dot-like brush work of the Pointillists. Unfortunately, by the time this work was painted—around the time the Ash Can School artists broke onto the scene—Impressionism really wasn’t a cutting-edge movement anymore. Metcalf’s favorite subject was landscapes. He especially favored those of New England. His works of the northeastern landscape earned him the unofficial moniker of Poet Laureate of New England Hills. If this work isn’t exactly whimsical (I usually despise that word when discussing a work of art), it is certainly imaginative and clever. I think it gives the same amount of interest in the sense of depicting nature as the Metcalf painting. 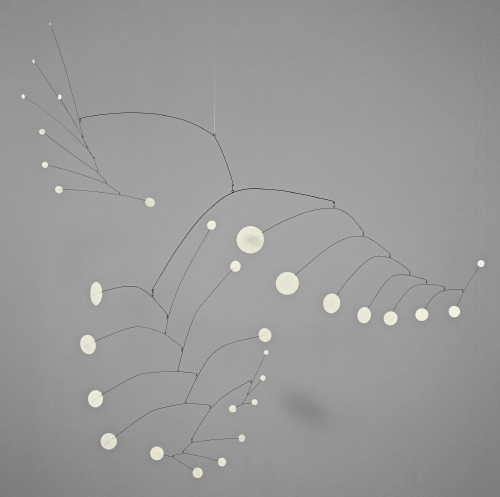 Calder was the son and grandson of academic sculptors. After he went to Paris in 1926, he never reached back to that heritage. His moving toys and figures of the late 1920s became part of his famous “Circus” installation that became a big sensation in both Paris and in the US. I know we aren’t in Spring, yet, but I was intrigued with this lovely piece by Truitt. 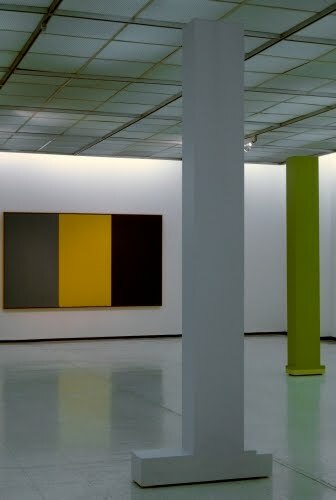 She’s such an interesting and complex person, I hesitate to categorize her work as Minimalism, although this piece was part of an exhibition at the Emmerich Gallery in New York on Color Field artists. Born in Maryland, Truitt earned a degree in psychology before World War II (1939–1945), and worked as a psychiatric nurse during that war. During the day, she wrote poems and short stories. She wed a man who worked for the State Department and they traveled all over the place, including Japan from 1964–1967. She studied sculpture for the first time academically in 1949 at the Institute of Contemporary Art in DC, and then at the Dallas Museum of Art. It was after that she began to explore various media and techniques, including cast cement and steel welding. She settled on what would be her signature style in 1961. She never categorized her work as an emphasis on geometric form or color. 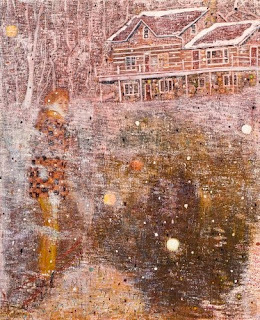 Yes, here’s a painting with a person walking around in a merry daze as the snow falls. I particularly like Doig’s work because so many of his paintings seem like waking dreams. And his surfaces are such complex layers of color and depth, especially his non-snow landscapes. I really like contemporary artists who are able to throw a visual curve, which is the response I got from this set of vessels she designed for Nymphenburg. I don’t really expect to see a competent ode to classical art these days, especially not in porcelain, but it sure is a treat when you come across it. I thought “old man winter” was a good way to end this post. This piece is simply stunning for its surfaces! Jongerius was born in De Meern, near Utrecht. She actually investigated woodworking before getting a design degree from the Eindhoven Design Academy. She currently designs textiles, furniture, and ceramics for a number of different firms. 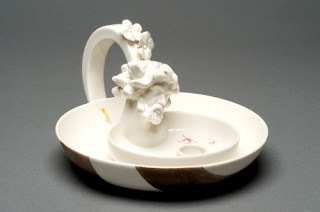 While in school she emphasized textiles, although a ceramics piece that she had designed earned her more attention. Jongerius is interesting because she combines hand-crafting and hand-painting with mold work. She also combines classical aesthetics with contemporary sensibilities. This candleholder comes from a set of vessels called “The Four Seasons,” a stunning set of wine jug, tea pot, hand mirror, and candleholder.